In medium bowl, combine flour, baking powder and salt; set aside. In large bowl, combine 1 cup of sugar and vegetable oil; mix well. Beat in eggs and mint extract. Gradually beat in flour mixture. 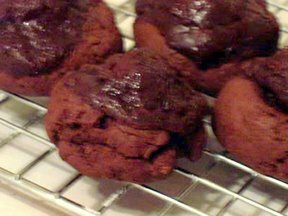 Stir in chocolate morsels. 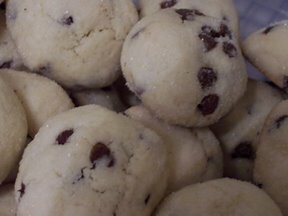 Shape into balls using roounded teaspoonfuls of dough; roll in remaining 1/4 cup sugar. Place on ungreased cookie sheets. Bake at 350 degrees for 8-10 minutes. Cool on wire racks. Yes, I realize this photo is really, really terrible. In a large mixer bowl, beat butter with electric mixer about 30 seconds or until softened. Add sugar and beat until mixture is fluffy. Add egg and vanilla. Beat well. In a medium bowl, stir together flour, cocoa powder, baking soda, baking powder and salt. Gradually add flour mixture to butter mixture, beating well. Shape into 1/2-inch balls. Place on ungreased cookie sheets. Press down center of each ball with your thumb. Drain cherries, reserving juice, and spread cherries out on paper towels to dry. Cut cherries in half. Place half a cherry in center of each cookie. Bake in preheated oven about 10 to 12 minutes or until edges are firm. * My grocery store only had fat free sweetened consensed milk, which I think made the frosting not as pretty as usual (although it may have been my crappy oven… it’s so hard to control the temp in that thing). It still tastes good if you’re looking to make them healthier where you can, but if you’re going for looks I’d stick with the regular stuff. ** I just used two teaspoons to dollop the frosting on each cookie. Preheat oven to 375 degrees F (190 degrees C). Grease cookie sheets. In a large bowl, cream together the butter, brown sugar, and white sugar until smooth. Beat in the egg and brandy. Combine the flour and baking soda; stir into the sugar mixture. 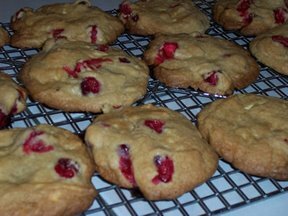 Mix in the white chocolate chips and cranberries. Drop by heaping spoonfuls onto prepared cookie sheets.